My girlfriend hates fantasy sports. Let’s be real. I spend hours fretting over who to select with my first, sixth, and fifteenth picks, while that time could have gone to something useful, like planning a romantic getaway for us, or writing that novel I always talk about, but never actually act on. I don’t mean that she is unaware of fantasy sports, or that she is indifferent to them. She hates them. She’ll probably never admit it, but I know it. That one time at her cottage when we had to find internet at a coffee shop 50 kilometres away so I could choose my hockey team (Blades of Steel, 2011 Yahoo Public League Champion) probably sent her over the edge. Until then, it was just an amusing distraction, a “boys will be boys” activity that would never interfere with our lives. But on that October day, she caught a glimpse of that part of me that will never die, that sports crazed, stat-crunching teenager, and she’ll never look at me the same way again. Girlfriends and wives have hated fantasy football since 1962, when a group of Oakland Raiders executives came together to conceive of the very first fantasy football league. They introduced many of the concepts that we all know and love today, such as drafting individual players, and awarding points based on touchdowns. Since then, there have been some changes (points now being awarded for yardage, defensive teams replacing individual defensive players) but the basic concept survives to this day. 1) I base my experiences and instructions on Yahoo Fantasy Sports, which is where I hang my hat as a fantasy player, and as such those of you with teams on other websites may find some of my instructions misleading, confusing, or generally useless. 2) I am not that good at Fantasy Football, so don’t listen to me too closely. OK, moving on. One of the best parts of fantasy football is the live draft. This can be done in one room with a group of friends and a big board, or, through the magic of the internet, in a quasi-chat room. Either way, you’ll generally find draft rooms have two key essentials; 1) A big list of players available to be chosen, and 2) A lot of trash talking about every single choice made by every single player. “Tom Brady? Good luck, pal!” or “Calvin Johnson? Pffftt, he’s ok, I guess.” And the like. It’s mostly all in good fun, although sometimes you might end up with that one guy who takes it all just a little too seriously, and feels compelled to spout his prior fantasy record in quick response to every comment. “I won with the last pick two years ago, BRO!” No one cares; move on with your life. Once you know your placement in the draft order, you can start to structure your draft strategy. Picking first invariably means you’ll end up with an absolute beast of a player (Arian Foster or Ray Rice, for example) but it also means that you have to wait about 20 picks before you get to select your second and third players. Unlike real-life drafts, fantasy drafts tend to snake back and forth, so picking first in round one means picking last in round two, then first in round three again. When picking first, I usually try to have the three key positions (quarterback, running back and wide receiver) covered with my first three picks. That at least guarantees steady production from all three positions. For example, if I were picking first this year, I’d probably go with Rice at Running Back, and then when my second and third picks came around, I’d aim for Matt Ryan at QB and Victor Cruz at wide receiver. Read disclaimer 2 if you feel the need to pipe in sarcastically here. Picking in the middle of the order could alter your strategy substantially, and picking at the end of round one would alter it further. In any case, my aim is to have a complete set of positions early on. I rarely save my starting QB or receivers for the later portion of the draft. Those last rounds are best reserved for kickers and Team Defenses. (Rather than individual defensive players, defenses are selected as whole teams, i.e. the Baltimore Ravens, and points are awarded based on Interceptions, Fumbles, Sacks, and Points Allowed) And yes, Baltimore is a good one to get if you can. A little pro tip here; make sure to keep an eye on the players’ bye weeks, and space them out as well as you can. There is no worse feeling than looking at your roster on a Tuesday morning and realizing that you’ll be missing five players this weekend. 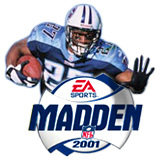 Eddie George was a fantasy beast back in 2001. Once you have negotiated your way through the rigmarole that is The Draft, you’ll be left with a squad of players to whom you have absolutely no connection, except that for the next seventeen weeks, every time you see their names scrolling along the bottom of Sportscentre (or Sportscenter, for our American friends) you’ll instinctively shoot your gaze down to make sure there is no injury. You’ll also have a keen interest in whomever your defensive team is playing against in the upcoming week. From time to time, you will be grossly disgusted with a roster move you made earlier that week. You chose to play Reggie Bush over Darren Sproles, in a completely logical and clear-headed way, by analyzing matchups and hot streaks and how each player performs on certain types of turf. And yet, Bush has just been stopped three straight times at the goal line, while Sproles is zipping up and down the field like a gazelle on steroids. “WHY did I start BUSH?? WHYYYY?!?! ?” you’ll cry as Sproles somersaults into the end zone for the third time while Reggie Bush is carted off the field. This will happen to you, in one way or another, this season. My best advice for this; once you’ve made your choice, don’t watch what the guys on your bench are doing. If your benchers are racking up points with reckless abandon, at least take solace in the fact that they’re not on the other guy’s team. And hey, it’s all in good fun, right? 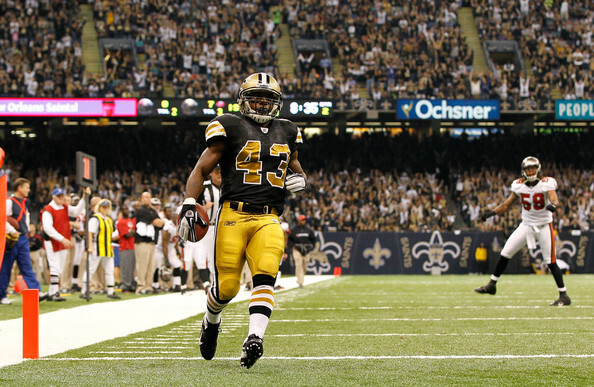 Darren Sproles sauntering into the end zone. WHY DIDN’T I START HIM?! Wrong! Fantasy football managers are snakes in the grass, just waiting to pounce on you the second you let your guard down! Maybe “JETS2012LETSGO” has been noticing that you keep Greg Little on the bench most weeks, and also knows that Shonn Greene has been exceedingly lucky the past few weeks, and is due for a cool-down. So maybe he suggests a trade, whereby you pick up Greene, the greatest running back since Barry Sanders, while merely surrendering Little, who is basically a streetcar driver. Reggie Bush is still in traction from that goal-line debacle a few weeks back, so you need a running back like Greene, a truck of a man who looks like he was carved out of stone. You accept the deal, having pulled a fast one on “JETS2012LETSGO”, that sucker. Suddenly, that very same weekend, defenses have marvelously adapted to Greene and the Jets’ running game, stuffing him and bruising him and rendering him completely useless. Meanwhile, Greg Little has suddenly become Jerry Rice, catching every pass thrown his way, and even some NOT thrown his way, destroying cornerbacks and safeties, and just straight up shitting on the whole NFL. The humiliation culminates in your final week, whereby you are matched up against “JETS2012LETSGO”, needing a victory to make the playoffs, and his Greg Little-powered, Ferrari type offense destroys your Shonn Greene-dependent Yugo of a team. And you ask yourself; Is it all in good fun? Why do I waste my time with any of this? I wonder how that girlfriend of mine is doing? And you try to answer those questions, vainly, until the following August, when it’s time to do it all over again. Addendum: I just completed my fantasy football draft, and am feeling pretty confident about my chances this season. You’ll find that neither is anyone else, no matter what they say. Injuries and luck have a lot of sway here, so you’ll find the majority of fantasy players have some good teams and some bad. If they claim otherwise, they’re lying to you. That guy in the next office who “wins all the time” doesn’t win that often at all. Victor Cruz production is unrepeatable and thus he is over-rated! Matt Ryan always throws like crazy in pre-season and then poops when it matters! I DON’T KNOW HOW TO READ DISCLAIMERS! FANTASY FOOTBALL!!!!!! full disclosure.. I snagged Victor Cruz on the waiver wire after his first big game last year and immediately dealt him for RB/WR depth, thinking I was capitalizing on a hot hand who would soon cool down. and then his season happened. so much bitter rage. It’s like an angry grapefruit up in hyah! As it turned out, I had third pick. I ended up with LeSean McCoy, Jamaal Charles, Larry Fitzgerald, and Eli Manning. (Not so) sleeper pick, Torrey Smith, assuming Joe Flacco finds the range to make him more useful than just a deep threat.